Hold on to your lips because this bacon explosion smoked fatty recipe will have you drooling all over your self and maybe even on those around you. If you’re not familiar with a smoked fatty a.k.a. bacon explosion across the Internet, here’s a quick description before you dive in to and watch the entire video making of this grill top delicacy. The bacon explosion is basically sausage meat stuffed with cheese, peppers, spices, and anything else you desire, wrapped in a bacon weave and smoked low and slow till it hits adequate temperature. 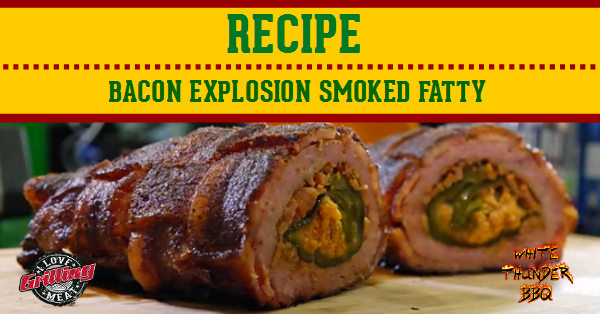 Ask anyone who’s tried it and they’ll tell you it’s typically a BIG hit with the family and friends so pay attention as you watch the entire video walking you through this bacon explosion smoked fatty recipe. Put your package of bacon in the freezer for about 30 minutes prior to starting your weave as it’s much easier to work with when it’s slightly frozen. Place a layer of plastic wrap or parchment paper on a cutting board and make your bacon weave on top. This will make moving and positioning your weave much easier. Use thick cut bacon for great results. Slow the video down at 1:11 to watch carefully how the weave is done. Hope you enjoyed that deliciousness as much as we did! How To Make Beef Bacon If you think that everyone loves bacon now, just wait until you learn how to make beef bacon and blow their minds after watching this video!